Envirogard's range of "Standard" decontamination showers is intended for sites where utility services - electrical power, water, drainage - are available [click through to our section on self-contained trailers or site services equipment if not]. Designed and constructed in the context of H.S.E. 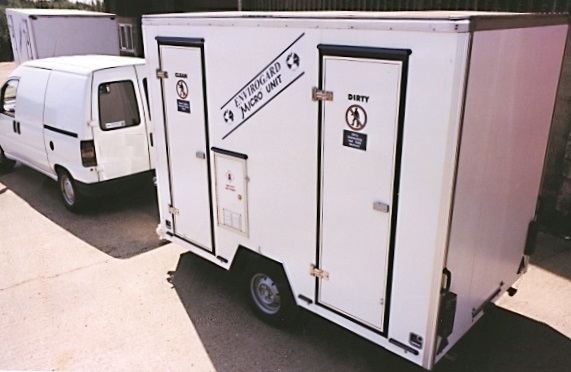 guidelines for provision of welfare facilities and decontamination showers, these hire units provide hygiene facilities for personnel working in and around contaminated sites. Unlike a static jackleg unit they can be sited without the need for a crane, and can be towed by most medium sized-vans or cars. For decontamination purposes there are three compartments which provide separate, designated, "dirty", "shower", and "clean areas". Thermostatic heaters maintain a comfortable temperature, while hot water for the showers is provided by an on-board water heater. For most trailers the electrical power connection is through a 16amp 240v chassis inlet plug - we supply the matching trailing socket with the trailer. The requirement of the water heater is a clean water supply of pressure between 1 bar and 6 bar; this can normally be achieved from a 15mm dia. hose. connected to a main tap. * a waste-water filtration unit. The "Standard" range runs from the Micro single-shower trailer unit (with a footprint small enough to fit in a parking space) - through an increasing size of 2 and 3 shower trailer units - to the Maxi Quad 4-shower trailer. 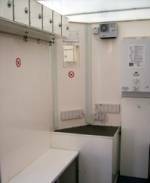 Also available are hybrid combination units; these incorporate a welfare/mess facility plus a decontamination shower section, within a single trailer - click through to Envirocabin for details. Most models use LPG for water heating, supplied from cylinders located in an externally accessed locker; this has the advantage of keeping the electrical power requirement low. 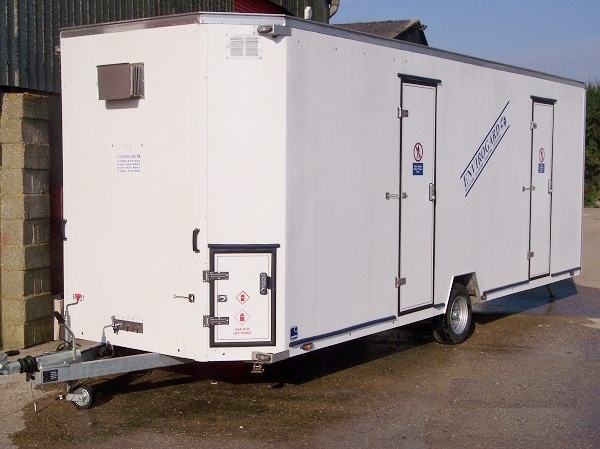 If however you would prefer to operate using solely electricity for space and water heating then we have a range of 1 and 2 shower decontamination trailers for this purpose; as these units require a larger electrical power supply - please click through to All Electric for information. Envirogard Micro decontamination unit - designed to fit into a car parking space, only 1.75m wide (less than 6 feet). Easy to tow and relocate around site. With a long 6.4m body (7.6m overall length) Envirogard's Maxi Quad decontamination shower is close to the maximum permitted length for road-tow trailers, but its single axle means it is highly manoeuverable. If you need still more space - try Envirogard's new Maxi Quad XL; slightly longer and wider, and equipped with twin axles, a different internal configuration makes for an even more spacious "Clean" changing area. THE ENVIROCABIN HAS NOW BEEN SUPERCEDED BY THE SOLUS III - DETAILS OF THIS CAN BE FOUND UNDER SELF-CONTAINED DECONTAMINATION UNITS. Envirocabin Combined Site Welfare and Decontamination Facility - all within a single trailer. Twin Shower Decontamination section. Separate Mess / Galley Area. Separate W.C.
Hand wash facilities (hot and cold water) in the shower and the W.C. compartment.